2,174 ft. The Northern Fells literally fall off a cliff on the east facing slopes; steep sided fells ending abruptly over the villages of Mungrisedale, Mosedale and Bowscale – not much late evening sun for their inhabitants! 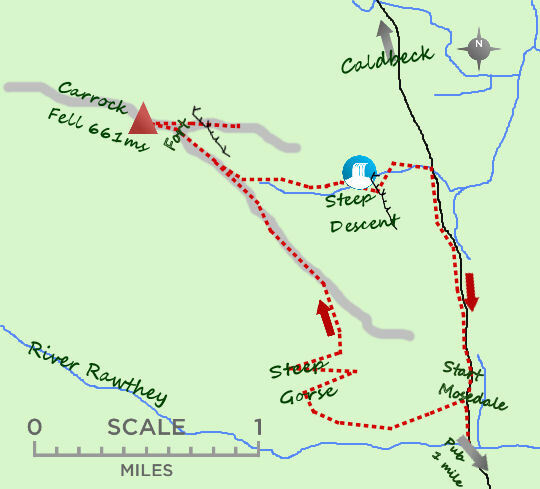 The walks are surprisingly difficult in their lower stages and I have certainly always struggled to find a good track up the southern slopes of Carrock Fell. Loose, volcanic rock, thistles and heather contrive to offer a tortuous start but once the main ridge is reached Carrock Fell is full of interest (Carrott fell as my daughter insisted on calling it). It is rugged in looks due to the unusual appearance of its volcanic rocks, contrasting with the smooth slate clad fells in the neighbourhood whilst the summit is characterised by a clearly visible ancient hill fort. The walls can be traced around the summit area with 4 clearly defined entrances pointing at the points of a compass, centred around the summit itself. The summit was also a centre of activity when I was last up; colourful hang gliders making the most of the steep sides and extensive views of this surprising fell. Recommend: Descend via the very steep east face, fun but tricky. Terrain: Trackless on the lower slopes, excellent underfoot after the initial haul. The descent is steep and eroded. Eating & Drinking: The Mill Inn in Mungrisedale is a fine and still very traditional Lakeland pub. I have always found it open all day.